We normally think of Jesus as kind and compassionate. But the Scripture also shows us another side. 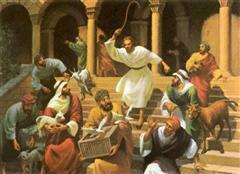 We see an angry Jesus striding into the Temple to cleanse that hallowed space from the wicked moneychangers. With whip in hand he drives them out and overturns their tables. Why? What provoked the gentle Jesus to this violence? It was simply this: The House of His Father was a den of thieves, and no longer a house of prayer for all nations! Jesus knew that spiritual power was being wasted by an official religion that had found something better to do that pray. It wasn’t what they were doing, selling sacrifices, it was what they were not doing. Where can we learn about the power of a praying church? The Book of Acts, Chapter 12. King Herod lifted himself up against the church. It must have taken the early church by surprise. Suddenly James, the brother of John, a son of Zebedee, one of Jesus’ inner circle of disciples, was simply gone. The sword of Herod had struck him down. The wicked King saw how this pleased the Jewish leaders, so he arrested Peter and put him into jail. In their grief, the church started to do the most effective thing they could do. They started to pray, together. They prayed constantly and earnestly. That very night, while Peter was sleeping in the depths of the jail, bound with chains between two soldiers, an angel of the Lord stood by him. Light flooded the prison. A painless, angelic blow to Peter’s side and a command to stand up brought Peter to his feet. His chains fell away. The angel told him to get dressed and follow him. Peter obeyed, thinking it was a vision. They passed guard after guard who were powerless to stop them. 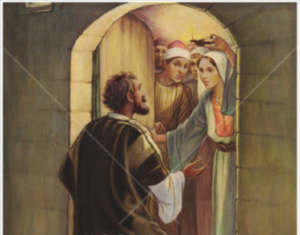 The prison doors opened of “their own accord” and the angel led Peter into the street and vanished from sight. Peter shook himself and realized that it was real; he was free! He knew where to go. The church had gathered to pray at locations throughout the city. One of those places was the house occupied by Mary, the mother of John Mark. While the people were making prayer for Peter’s deliverance, he knocked at the door. Rhoda, a young girl was sent to the door. 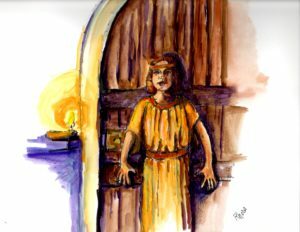 She recognized the Apostle’s voice and got so excited she ran back without opening the door. It took some convincing, but the prayer warriors finally agreed to see if Peter was really at the door. They opened the door to one of the most important answered prayers in the Bible. They were astonished, but Peter was free and the power of a praying church was established for the ages. In early 2001 I made an extended trip to this Eastern European country. I saw many things in this broken land but one thing stands above all other impressions: These people know how to pray! For years, the whole church, not just a few who are “gifted” in prayer, but the whole church has gathered for an hour before Sunday morning church just to pray. Though I couldn’t understand their language, the spirit of their praying was clear to me. The sound was like the descriptions of worship in Revelation. They didn’t need music to pray. A prayer leader announced a need; they sang a song about it and then they prayed. It was prayer like I imagine prayer was in the book of Acts—intense, loud, and fervent. This was no silent moment of meditation. What were the results? These people, along with their counterparts in other lands, prayed down Soviet Communism! Fifty years of spiritual oppression fell before their prayers. Eleven years before my visit, the revolution that brought freedom to Romania started in the city where I witnessed the powerful praying, Timisoara. For a week, this city of half a million stood alone against a communist government. Buildings in the city square still bear the marks of the machine gun bullets. Children were massacred on the steps of the Cathedral when the Orthodox priests closed the doors. In their homes, Christians were praying. In their church buildings, people were praying. In the streets, believers were praying and singing “He’s Coming Soon”, the theme song of the revolution. Far away in the capital of Bucharest, their dictator was arrested and tried and executed by the people of Romania. 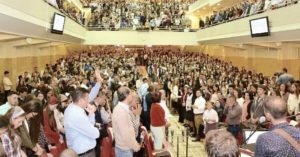 I have talked with and worshiped with people, my brothers and sisters, who have won a victory of Biblical proportions, like that in Acts chapter 12. How?—Because prayer was made by the church! 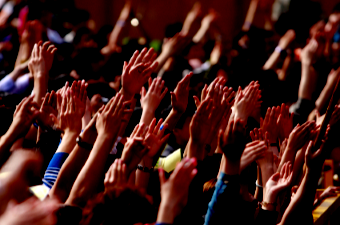 We must see the wasted power of the American church—corporate prayer! —And be as provoked as Jesus was! To proclaim the Kingdom and Power of God, not protect the petty little provinces of our personal power. Too many times we have changed the House of God into something other than a House of Prayer for All Nations. We are too often a prayer-less and powerless church. Jesus quoted Isaiah that day. The word Isaiah used was the Hebrew word for hymn—tephillah. We must understand that this type of prayer is prayer that is sung by the congregation. The great songs of yesterday that live on in the life of the church are often songs of prayer. The great songs of today are also songs addressed to God. The people pray the same prayer at the same time—mental agreement. The people express the same emotion of the music of the prayer— agreement of the soul. The Holy Spirit empowers the same petition to rise from the hearts of the people to very the face of God—spiritual agreement. To bring healing to our nation. No wonder the promise of the Old Testament is still true today! Note the songs of prayer and sing them with your brothers and sisters! When given an opportunity to pray, do so fervently, in agreement with your leaders! 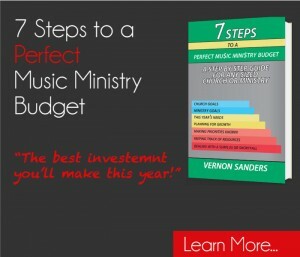 Then, don’t be surprised when the answer to your church’s prayer comes knocking on your door!